Purchased the CH Eclipse Yoke about 12 months ago. Has worked fine with no problems at all. I had an older CH yoke for about 8 years prior to this but that one had its day. 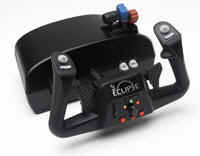 This new Eclipse Yoke is just as good, if not packing more features like the finger paddles which are great for rudder controls (if you dont have pedals). Attaches firmly to my desk and actions are smooth and consistent. Happy with this yoke.